Good thing she is super cute. I made this fashionable vest thing I pinned from this blog and it really was as easy as she said. It would be a great nursing cover too and I actually think that using a tshirt with a pattern might look cool , watch out Lars I’m after your tshirts…. 1. the red box is full of kettle bells and weights because I work out here. 2. The huggies box is full of hand me downs waiting on growing girls to grow. 3. the basket on top of that is Lars stuff – since he only wears jeans for ‘going out’ they stay pretty clean so they hang out there. We joke that daycare probably thinks he only has one pair since he puts them on to drop off kids and comes home to change for work so they log about 15 min a day. 4. you might not be able to see it, but, the colorful things on top of the black cabinet are cloth diapers that Fiona STILL has not grown into. On the right is my ‘stand up desk’. It is really just my laptop on top of a box on top of a table, but, the table has drawers that I put office things in and it is the perfect hight for me. Sitting is the new smoking (I heard) plus, I have no lap to sit on if I’m standing. This vantage is great because I can see most of the top floor and hear anything so if they are playing I can do some things on the computer. Ps. A big ‘I’m sorry’ to all the e-mail subscribers who got just a random picture of my backside – I auto-published by accident using my phone to upload a picture. Hopefully the story behind the behind is worth the 300 words. I also slightly wonder about the 2 likes my bottom got but hey, I’m going to take it as a compliment. , originally uploaded by katymac79. 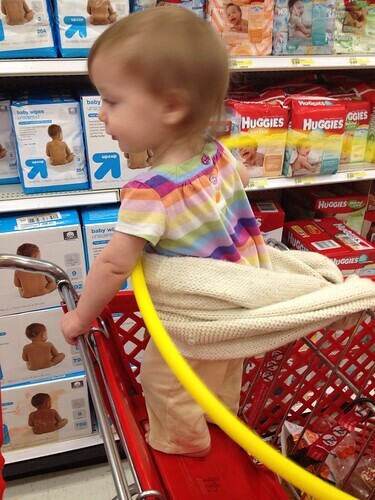 When the belt from the cart just is not enough the infinity scarf is a nice cozy restraint. ps. I have no reason why I end up taking so many pictures in the target diaper aisle – we don’t even buy diapers there, we were just passing through. Sorry about yesterday, so nothing exciting happened it was not worth the trip to the real computer to make words appear on the screen. Actually, the weekend was just one of those weekends that I needed a day to recover from it (and not in a good way). I’m not sure there was 20 min in a row where one child or another was not wining, wailing, or a combination of the two. Monday 2 of the 3 are in school and thank goodness. Fiona is starting to resist naps but needs naps so that is a challenge but at least on Monday she was my only child to navigate around. Next weekend will be 100% better because we are going to go to an indoor waterpark and see friends and I’m ever hopeful that Lars will mind all 3 for some time so I can do things with two hands. Today even with all 3 things were better for my day ‘off’. We did our normal library trip and story time and got to the bank and post office too. Rests happened in some way or another and then the bigger girls played in the snow. Niamh is looking for R things to cut out, Zoe is eating a snack, and Fiona is roaming the floor looking for trouble (little does she know I swept already so all the food she chucked on the floor for later is gone). I wimped out and I’m not taking all of them to the grocery since Lars is off tonight he can share that chore with us. Rodposse – very pretty pictures and short blurbs about them. 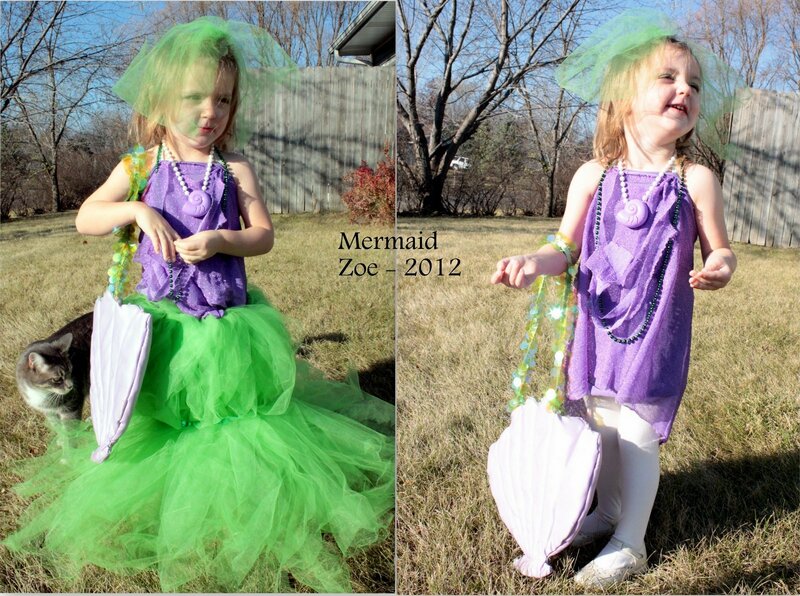 This post is my how-to for the Firestar costume I made for may daughter for Halloween. I know that was a month ago but I had a request for directions so here they are. My daughter fell in love (in a 4 year old girl way) with Firestar – a very very very lesser known Marval super hero. She is on “Spiderman and his Amazing Friends” but basically she wanted to be a superhero and this was the only female one she knew. Anyway, as costumes go it was pretty easy and I think can be adapted to most of the superhero women out there. craft foam in red and orange – how much depends on the size of your costume. First, the body suit. Firestar is ALL YELLOW and you may know, they don’t sell bright yellow leotards so I had to dye my own. 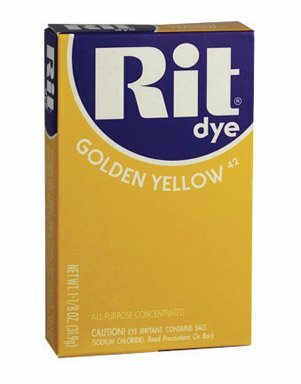 I’m not an expert in the matter of dyeing, I basically followed the directions on the RIT dye bottle and I used a bucket because I’m not going near my washing machine with anything that could turn all my stuff yellow. 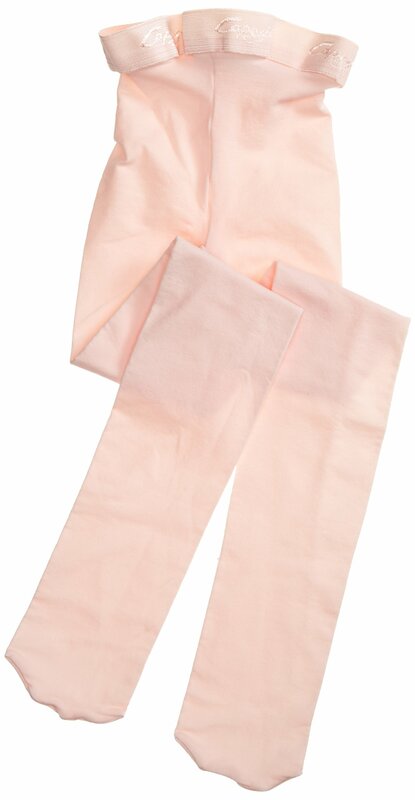 My only two pieces of advice here is 1. get matching tights and leotards – if you get pink get pink, if you get white get both white then they should end up the same color when you dye them. 2. Get cotton, it takes the dye better. The nice thing is that after Halloween, a pair of nice yellow tights are a decent add to a wardrobe where the little girl wears dresses 90% of the time. Follow the directions on the box, I won’t risk my washing machine but I have a nice bucket for the messy jobs. Next major component of the costume are the flame boots and gloves. I used red gloves from the store, boots we already had that she could slip her feet into and out of easily and then craft foam for the flames. Measure the wrist and the length from wrist to mid arm. Draw the wrist section with a slight curve and then draw lines radiating out apx 30 degrees with a length equal to the wrist to mid arm measure and then connect the two points with an arch. This will make a cone like glove. If you want more flare or less adjust the angle of the line. Make a paper patter fist so you can adjust length and curve easily then trace two onto the foam. ** Don’t make these too long, the orange level of flame will increase the total length by an inch and you don’t want to impeed elbow movement. I forgot to take a picture of the flame for the gloves but it is done the same way as I show in the boot step below. I tried to use velcro to close the glove but it didn’t work out well so I used red duct tape to make a wrist band just large enough for her to slip her hand through. This is more tricky and I can’t say I’m 100% pleased with how it turned out but it did last the Halloween season. The boot upper and toe are in two pieces on purpose so the foot can move easily. Step one – the upper – wrap a rectangle of foam around the top of the boot and cut to measure. Make the height just taller then the boot (flame will make it taller). The foam should part over the foot/toe section of the boot and that is fine. Step two – Hold the foam upper in place around the boot and slip a piece of paper over the foot/toe and slightly under the foam. Trace the opening over the foot and around the bottom of the toe. cut out that pattern slightly large and check for fit. Use pattern to make two toe covers. Step three – Cut out the toes and using a big needle and elastic thread sew a running stitch (just up and down, nothing fancy) all along the top and then a long piece under the sole of the shoe. You can’t just tie the elastic in two spots in the foam because it will rip out quickly – foam is versatile but not strong. Most of the thread is covered but for the bits that did show I used a red sharpie to color them in. Once you have the basic covers fitting the way you like add velcro to hold the uppers closed. The other part of the velcro is under a flame that will cover the gap. Now it is time to add flame! On each red piece I free handed a flame design alternating between high and low, single and double flames along the respective top edges. The more ‘random’ the better and for lack of a better word I just cut ‘wiggly’ fire and it turned out pretty well. For the orange level I used a strip of foam large enough to cover the lowest point of any of the red flames and high enough to show about a half inch above the red. Be careful not to get too tall but otherwise just cut the proportions so they look right. Copy the length and curve and if you want to speed things up cut the two pieces together – that not only speeds up the process it also makes them match. I used spray glue on the red and then stuck it onto the orange – the other way around leaves sticky spots on the orange that will attract dirt and cat hair etc on the showing side. Using more foam fold a rectangle in half (so both halfs match). Cut what I think of as an angular butterfly and eye holes that are slightly rounded triangles I am sorry, I never took a picture of just the mask! It is secured with more elastic thread. My kids for some reason like wigs. Niamh has had a wig in her costume for 3 out of 4 years. This is an adult red devil wig I found at WalMart with the horns cut off but I’m sure any red wig you find will work. Put it all together and you have Firestar! In doing all my research there are many many versions of firestar so minor variations would be basically un noticeable by all but the most pure of purists. Given that only about 5 kids recognized Firestar I’m not stressing – those that did recognize it thought it was great and everyone else thought it was just a cool super hero costume.